I have Weil-McLain gas boiler for hot water heat and going to install WiFi thermostat that requires common 24V 'C' wire. I do have a free wire in the cable but cannot figure out where should I connect it on the boiler, there's no any terminal, marked as 'C', 'common' or similar. The system includes hot water boiler and central AC. Currently I use thermostat with battaries that has 5 wires going in. According to the CGa-010 wiring diagram, you'll want to connect the C wire for the thermostat to the terminal pointed to in this image. Notice the transformer is circled in red. 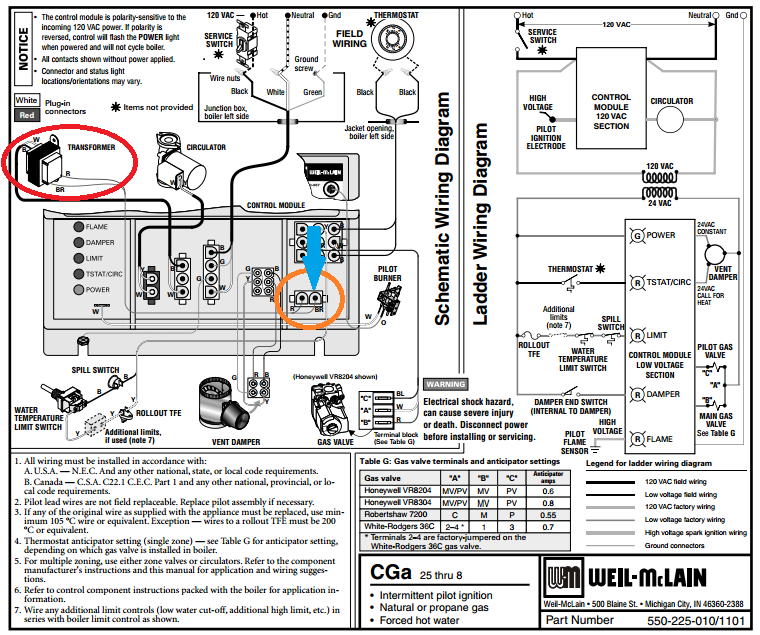 The location where the transformer wiring terminates is circled in orange. The "common" side of the transformers secondary is pointed to by a large blue arrow. Not the answer you're looking for? Browse other questions tagged boiler thermostat-c-wire or ask your own question.